*White Lily can be hard to find outside of the SE United States. It can be ordered online or you can acquire it by some other nefarious means. This flour is made from a soft winter wheat that grows in the South and has a lower protein and gluten content, which makes for a fluffier, lighter biscuit. You could substitute with other flour, like cake flour, but I haven't tried it. Pillsbury or Gold Medal all-purpose flour can work as well. **The butter and buttermilk has to be very cold. I even went so far as to stick them in the freezer while the oven is warming up and added these to the flour mixture only after the oven is preheated. 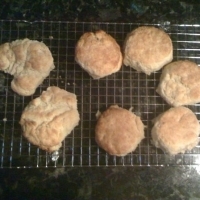 The reason for this is the butter melts in the oven and creates a pocket of air when it bakes so the biscuit is fluffy. If you allow the butter to melt and it incorporates with the flour, you'll get bricks. Go to the gym and burn some calories in preparation and to work up an appetite. When the oven is preheated, cut the butter into the flour mixture with a pastry blender or food processor until it resembles a coarse meal. Work fast. Make a well in this mixture and pour in the buttermilk and mix gently. You want to add just enough buttermilk so that all the flour/butter grains hold together. Don't add too much buttermilk and try not to handle it too much. Turn out onto a floured surface. Use all-purpose flour. You don't want to knead, but roll the dough out gently with a floured rolling pin and fold over 3-4 times. Roll out the dough until it's 1/2 inch thick (or thicker) and cut with a biscuit cutter. Place onto a greased cooking sheet. You can use more butter, or cooking spray. If you want crusty sides, separate them biscuits, otherwise place them together. 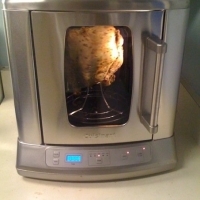 They will rise in the oven. Bake for 10-12 minutes or until the tops are golden brown. Wait at least an hour. Great great post! Thanks a bunch! Like justincredulous's recipes? Never miss an upload!